URGENCI, the international network of Community-Supported Agriculture, reached a new stage of maturity at the Vth biannual Symposium that was held in Monterey in California, 20th-23rd January 2013. The first three symposia took place in Europe - Aubagne, France (2004 and 2008), and Portugal (2005). URGENCI then successfully organized the first international CSA conference outside Europe in Japan in 2010. Japan is generally considered to be the cradle of contract-based partnerships between consumers and producers. Three years later the next URGENCI conference took place in the USA, another stronghold of the movement. The American CSA movement is currently experiencing a new wave, following the initial surge of the mid-80s. Whether there are 6,000 CSA programs nation-wide as Steve McFadden estimates1, or if more than 12,500 farms operating a CSA-type marketing model, as USDA estimations stated in 2010 is irrelevant. What is most important is as Steve McFadden(1) states, the American CSA is “at a decisive point. Is it going to become just another “business model” based primarily on monetary transactions for food? Or will CSA fulfill its ideal potential to become a model for healthy cells of social well-being, environmental health, and economic justice?”. These questions were at the heart of the discussions during the farm bus tour on the 22nd and the Conference itself on the 23rd. The presence of participants from other American states and 6 different continents was certainly beneficial to all participants, since these issues keep coming to the fore wherever CSA practice is firmly rooted. Some well-established movements have already gained precious experience in dealing with these delicate issues. The local participants - mostly organic family farmers - enjoyed learning through peer-to-peer exchange. 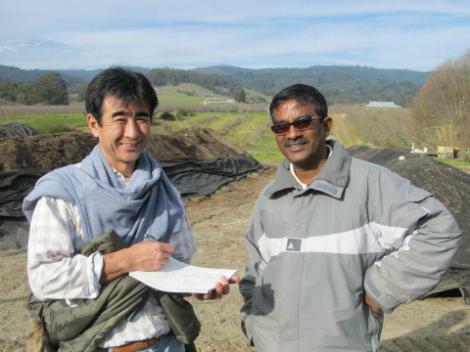 Shinji Hashimoto (Japan) and Joy Daniel (India), two of Urgenci’s Asian International Committee members during the farm visits. The new International Committee of 8 now includes a member for Latin America, as well as 3 special Ambassadors with specific briefs. Elizabeth Henderson, author of the famous CSA manual that has inspired a whole generation of both farmers and consumers around the world, Sharing the Harvest, generously accepted to become URGENCI’s Honorary President. She is a retired farmer and lifetime activist. This is a fair acknowledgement to her huge past contribution to URGENCI. The next URGENCI Symposium is scheduled to take place in 2015 in China. Microcredit has become a very widespread phenomenon on all continents in recent years, particularly since Mohamad Yunus was awarded the Nobel Prize in 2008. According to those who promote microcredit, it is a tool that enables the poor – particularly women – to overcome poverty. Yet there has been increasing evidence that not only is it not a solution, but it frequently allows investors to grow rich at the expense of the poor, whose indebtedness increases. Milford Bateman presented the theory he puts forward in his book published in 20102, « Why doesn’t microfinance work? », during a conference he gave in Canada. The secondary title of the book is: The Destructive Rise of Local Neoliberalism. It explains how in many if not the majority of cases microfinance is a poverty trap. Scandals in India, with Mafia-type loan sharks (that have even led to suicide), are very harmful. He also indicates that it is less and less viewed as a development tool, and that the big institutions, such as the World Bank no longer promote it. Although the book raises much controversy, it does put its finger on the problems we have already raised in this Newsletter. The dominant model has been mainly based on proposing microcredit from outside institutions, as a result of the support gained from the Nobel Prize. Others have made the choice of establishing people-led institutions. Thus when the legal framework is that of a mutual or a cooperative where the clients are members – and therefore associated with the governance – they provide a response that is genuinely adapted to the needs of local populations. Here is a brief overview of two such initiatives. The Mutuelle d’épargne et de crédit dans le secteur de la pêche artisanale en Guinée (MÉCREPAG), a savings’ and credit mutual in the artisinal fishing sector in Guinea was founded in 2006. It is the result of an association built with the national union of artisinal fishers in Guinea. In just a few years, MÉCRÉPAG has built up five local branches. In 2012 they had 10,000 individual members, 65% of whom are women. The loans that are granted allow fishers to buy outboard motors for their boats, and the women to smoke fish as well as to buy and sell fish at the market. Training on management of local cooperatives, healthcare loan-management are available to members. Both local branches as well as the mutual itself are governed by members who have been elected by the members’ assembly. In Canada, microcredit has been present in most regions for the last twenty years. Until recently the microcredit association were incorporated on the basis of not-for-profit organisations. After 15, this model was considered to have shown its limits, so the Fonds d’emprunt Québec, situated in the city of Quebec, decided to evolve, and switch to a savings and loan mutual, in order to propose loans to the disadvantaged as well as to promote savings and micro-insurance. Thus the Fonds d’emprunt Québec, a relatively small organisation, has developed a draft law that was adopted by the Quebec national assembly in December 2012. 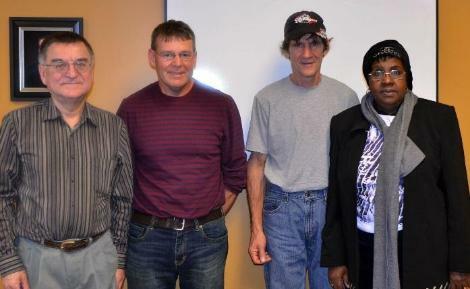 The new Mutuelle de microfinance (Québec) is the first of its kind in Canada. Clients of this new organisation are members, and can therefore elect their representatives to the Board and vote in General Assemblies. This was not previously the case. Although the socio-economic contexts are very different, both these examples illustrate how it is possible to create institutions by and for the people involved, and that they can also participate in their governance. This provides an alternative to microcredit, that in most countries is proposed by outside organisations that are not an integral part of the community.